The Texas Cowboy Hall of Fame honors Texas men and women who have excelled in the sports of rodeo and cutting. The inductees include Ty Murray (7 time World Champion All Around Cowboy), Tuff Hedeman (4 time World Champion Bull Rider), Charmayne James (11 time World Champion Barrel Racer), and Don Gay (8 time World Champion Bull Rider), just to name a few. Each booth contains photographs and memorabilia; and many of the booths also have video, depicting the honorees’ careers in their respective events. 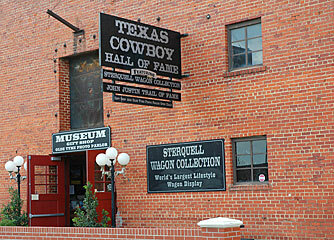 The Texas Cowboy Hall of Fame is open seven days a week. It also features a Western Gift Shop, Olde Tyme Photo Parlor and unique party facility.